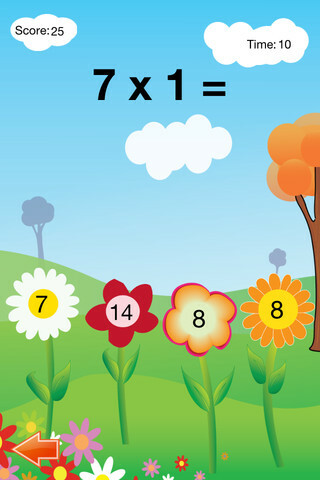 Times Tables Game (Multiplication) is a fun way for children to practice and learn the multiplication tables by heart. The gameplay is carefully designed, with the help of children, teachers and educational experts. Kids love practicing their times tables with this app. Times Tables Game is an educational app. Its objective is to aid in learning the times tables by heart. Anywhere, anytime, fun and easy! The game is designed in such a way that it challenges to keep practicing. It award (good) plays by medals, flowers, smileys and such. Faults are remembered and will be suggested to play again a next time. This is an educational method that is a real help in better learning the multiplication tables. Easy to use. Any table (1 – 12) can be selected to play. Even multiple tables in sequential order or shuffled. Ideal to prepare for the test at school next week. Special scoring system that awards points based on the difficulty of the times, speed and whether or not the table is played in sequential order or shuffled. Tip: shake the iPad or iPhone to shuffle ingame. The scores and tables already played are logged and can be reviews in the ‘Players and Score’ menu. Kids love to play and afterwards see their progress in the overview. And off course beating mum or dad’s highscore is cool!